This add-on device for the VecAdapt allows joysticks compaible with the Atari 2600 and many other consoles to be used with the Vectrex. The Up/Down directions can be used as extra button inputs, assigned using switches to Vectrex buttons. Used in combination with the "Button Swap" function on the VecAdapt, this allows a wide range of configurable button assignments. These are available to purchase at my online store, OmberTech. 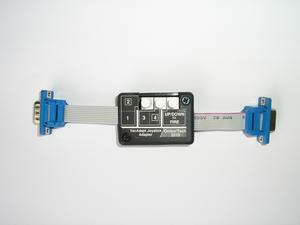 The add-on uses the multiplexing Select signal for the Mega Drive / Genesis controllers, buffered by transistors Q3 and Q4, to disable the button outputs when the unwanted button signal is active. 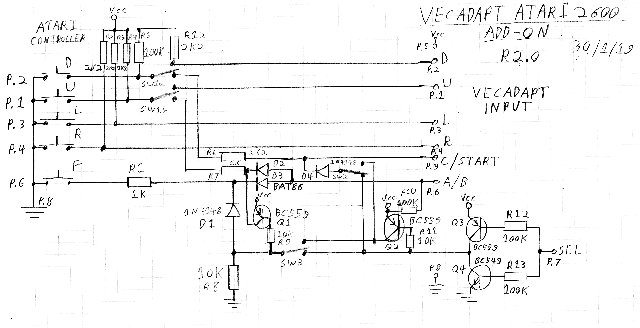 Otherwise the pressing of the Fire button, or Up/Down directions while "UP/DOWN TO FIRE" is activated by SW1, pulls the output Low, which registers as pressed at the Vectrex, via the VecAdapt circuitry. SW2 and SW3 configure the buttons by determining which stage of the Select signal causes the output to be diabled on either of the two lines used by Mega Drive / Genesis controllers for the A/B and C/START button signals.